Motorists on the H-1 freeway going west near Old Waialae Road got caught in the back-to-school jam yesterday as 35,000 students returned to classes. Hawaii's roadways once again look more like parking lots as tens of thousands of students return to school this week. If you thought traffic was bad yesterday, when students returned to classes at the University of Hawaii and private schools, it was equally bad if not worse this morning. Thousands of motorists inched along the H-1 Freeway and other major traffic arteries this morning in the usual back-to-school traffic jam. On the first back-to-school day, town-bound traffic along the Moanalua freeway was backed up to Red Hill until 8:30 a.m., said radio traffic reporter Danielle Tucker. 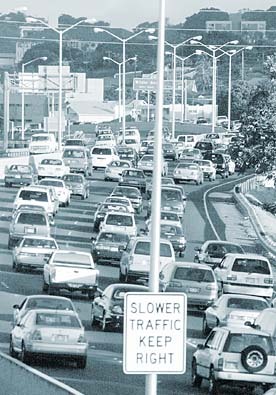 Traffic was also bumper to bumper along Kalanianaole and Pali highways yesterday. "It was awful," Tucker said. Two accidents at the intersection of School Street and Likelike Highway contributed to the congestion. Traffic also backed up along the H-1 freeway in Aiea as town-bound motorists slowed to read a campaign banner made by supporters of Republican lieutenant governor candidate Cam Cavasso that was held over the railing of an overpass. The supporters showed up about 6 a.m. and were told to leave about half an hour later by police. Cavasso said he was not aware his volunteers were planning to do that.